There will indeed be a G.I. 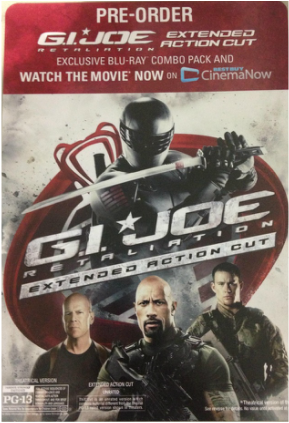 Joe: Retaliation “Extended Cut” Blu-Ray released in the US, and it will be an exclusive to Best Buy stores. So the word is that pre-orders will start on 7/16 (Tuesday) and that it will also appear in the Best Buy circular. Sounds like there are some incentives to pre-order, as you’ll be able to watch the theatrical version online immediately, then get the “Extended Cut” on the 30th with all other releases. This is great news and nice that thanks to the web and the member posting on the YoJoe forums we know about this before having bought the "wrong version First but might still in up with 3 or four copies of almost the same movie? G.I. 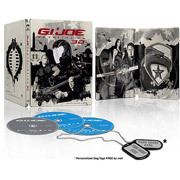 Joe: Retaliation “Extended Cut” Blu-Ray (3D Blu-ray + Blu-ray + DVD + Digital Copy) ;) ?